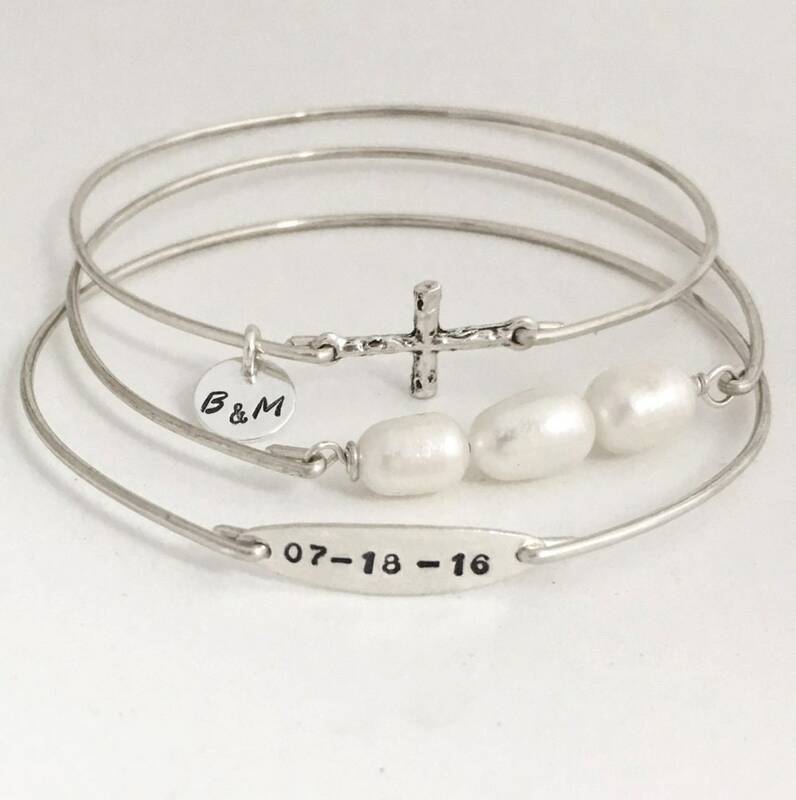 Religious Wedding Bracelet Set - Anniversary Bracelet Set - This set of three bangle bracelets makes for a lovely wedding gift or anniversary gift. It consists of a cross bracelet with husband's & wife's initials on a round disc charm. 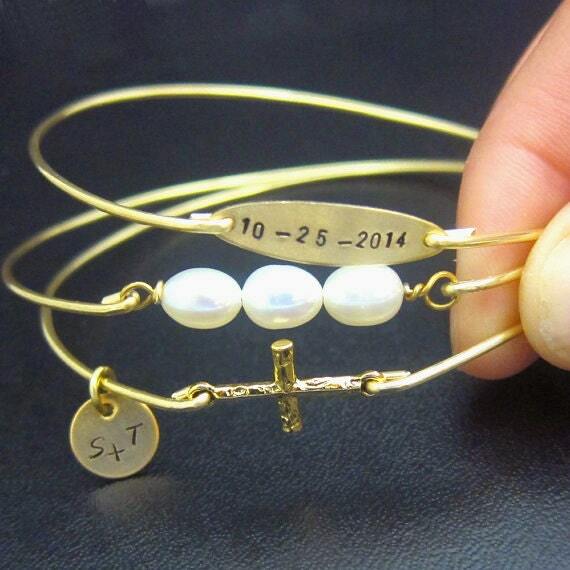 I can also also put the charm on the date bracelet or the cultured freshwater pearl bracelet if you would like. Simply mention preference in "notes" during checkout. 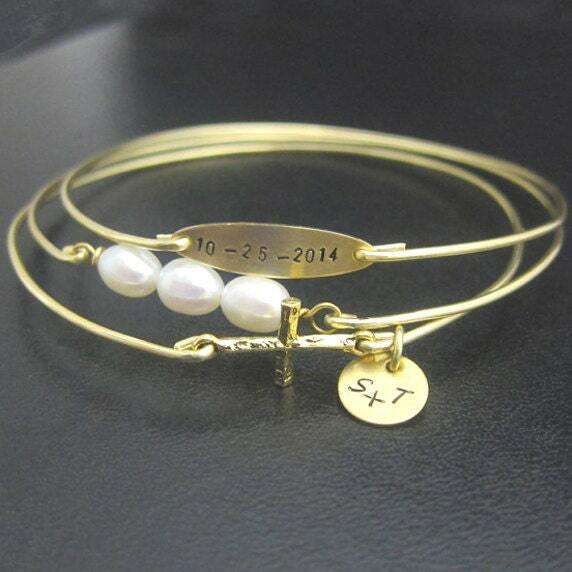 Next comes a date bracelet to keepsake the couple's wedding date or special anniversary date. The 3rd bracelet is a string of 3 cultured freshwater pearls. All bracelets in this bridal bracelet set are paired with your choice of finish for bangle bands, disc, and oval plate in either silver filled, sterling silver, brass or 14k gold filled. And cross is silver tone or gold tone. *** Instead of the pearls if you would like a different stone such as a rhinestone of a certain color, just let me know in the "notes" during checkout or message me. I have many different stones available in my shop for your personalized wedding bracelet set. This custom wedding jewelry set makes a great gift for the bride to be if you're looking for a bridal shower gift. And also makes a wonderful personalized anniversary jewelry for wife. 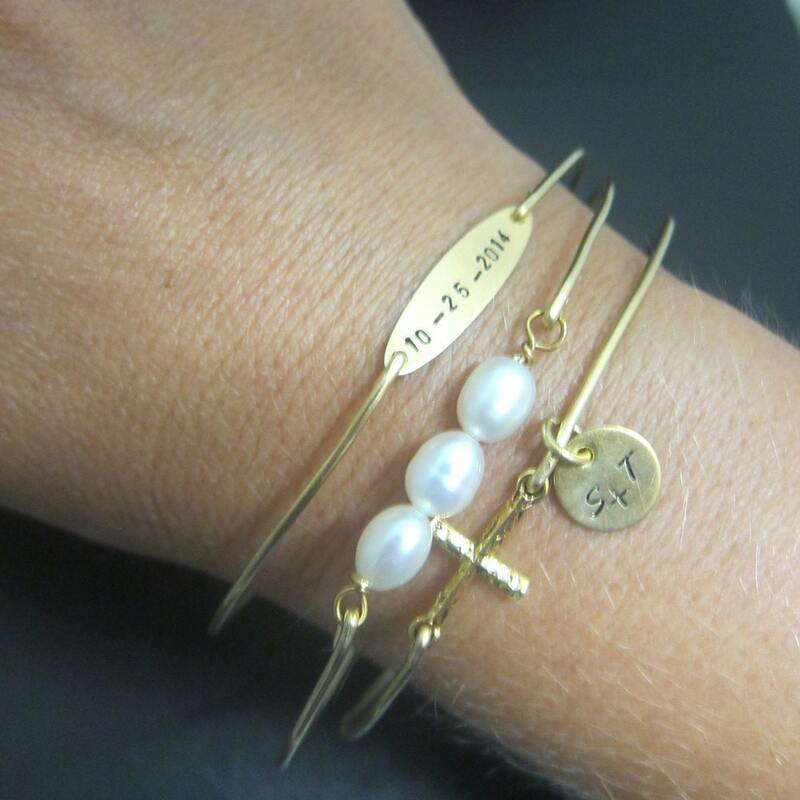 Please specify size in notes during checkout for your wedding or anniversary bracelet set. Choose from one of my regular sizes below by measuring one of your favorite bangles. Or give me the circumference of the widest part of your hand where the bangle has to be pulled over; than I can size your wedding jewelry for you. All of my bangles are closed and can’t be opened. Therefore, these wedding bangles have to fit over the hand. 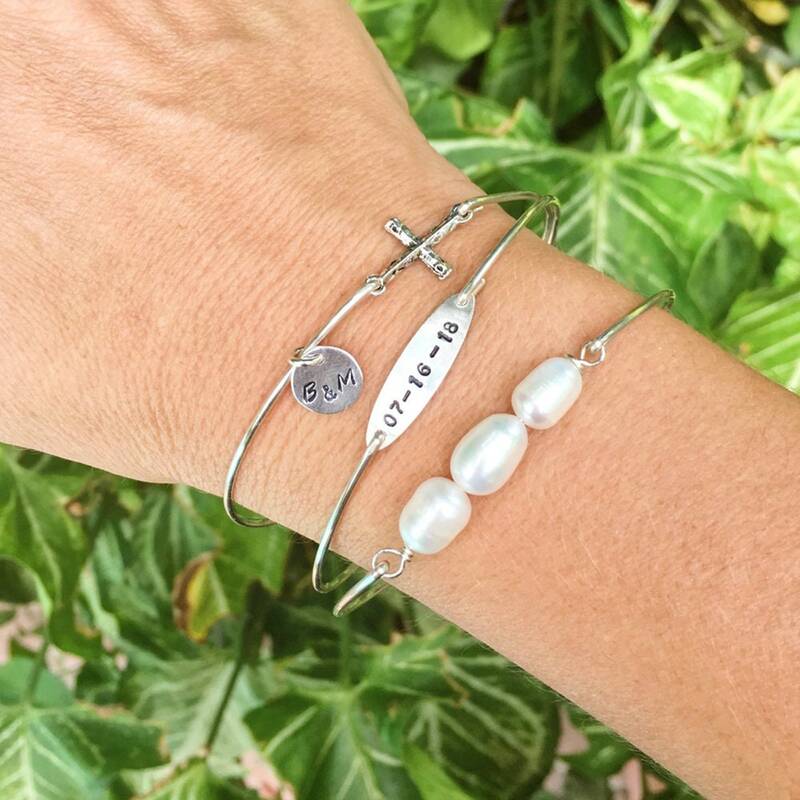 Custom: specify a custom size for your religious bangle bracelet set. This bracelet set created and hand crafted with great care and love for you and yours. All of my items including this wedding bracelet set are special handmade creations that are based on original Frosted Willow concepts & designs. I hope you love your wedding or anniversary jewelry. Incorporates designs with earlier copyright dates.